Electromagnetic Can Crusher Electromagnetic Can Crusher Welcome to my new can crusher page! Sorry for the poor settings of this photo. It is a display that I made for DeVry's IEEE club's display case. 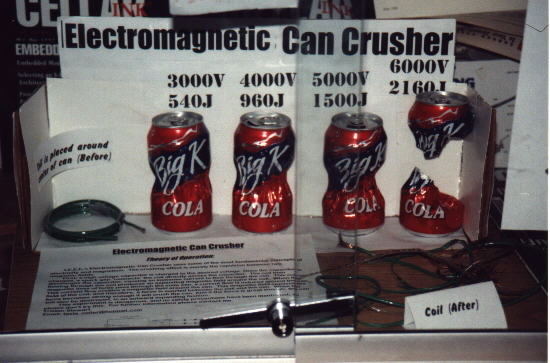 The electromagnetic can crusher uses very basic principles of electricity and magnetism. 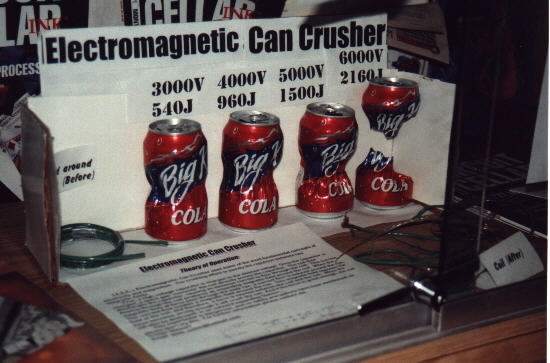 The crushing effect is just the repulsion of two magnetic fields. First, a capacitor is charged to a high voltage. The more voltage, the more crushing force (using the same capacitors). Once the desired voltage is attained, a spark gap connects a small coil to the capacitor. The coil is about 5 turns of #12 wire tightly wound around the center of the soda can. As soon as the spark gap fires the capacitor discharges an enormous amount of current through the coil (tens of thousands of amperes). This discharge creates a magnetic field around the coil. As the flux lines pass through the cross section of the can, current is induced and flows around the can. This induced current creates its own magnetic field which opposes the magnetic field from the coil. Between the two magnetic fields there is now a force pushing inward on the can and outward on the coil. 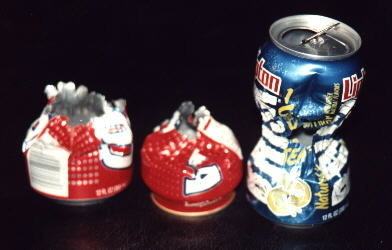 Once the force is strong enough the can is crushed. Here are a couple more pics, click to make them bigger. Click HERE for a electrical schematic of the can crusher. With one capacitor I have more than enough energy to blow a can right apart. I have found that with about 6kV charge (over 2kJ) that the can seperates in the center, and with a little more voltage, the two ends fly apart. I have launched the ends nearly fifty feet in opposite directions.